Although the exact beginnings of corned beef are unknown, it most likely came about when people began preserving meat through salt-curing. Evidence of its legacy is apparent in numerous cultures, including Ancient Europe and the Middle East. The word corn derives from Old English, and is used to describe any small, hard particles or grains. In the case of “corned beef”, the word may refer to the coarse granular salts used to cure the beef. The word corned may also refer to the corns of potassium nitrate, also known as saltpeter, which were formerly used to preserve the meat. Although the practice of curing beef was found locally in many cultures, the industrial production of corned beef started in the British Industrial Revolution. Irish corned beef was used and traded extensively from the 17th century to the mid-19th century for British civilian consumption and as provisions for the British naval fleets and North American armies due to its non-perishable nature. The product was also traded to the French for use in Caribbean sugar plantations as sustenance for the colonists and the slave laborers. The 17th-century British industrial processes for corned beef did not distinguish between different cuts of beef beyond the tough and undesirable parts such as the beef necks and shanks. Rather, the grading was done by the weight of the cattle into “small beef”, “cargo beef”, and “best mess beef”, the former being the worst and the latter the best. Much of the undesirable portions and lower grades were traded to the French, while better parts were saved for British consumption or shipped to British colonies. Ireland produced a significant amount of the corned beef in the Atlantic trade from local cattle and salt imported from the Iberian Peninsula and southwestern France. Coastal cities, such as Dublin, Belfast, and Cork, created vast beef curing and packing industries, with Cork producing half of Ireland’s annual beef exports in 1668. 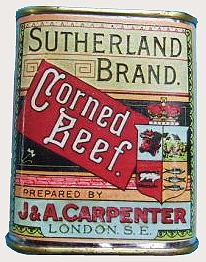 Although the production and trade of corned beef as a commodity was a source of great wealth for the colonial nations of Britain and France (who were participating in the Atlantic slave trade), in the colonies themselves the product was looked upon with disdain due to its association with poverty and slavery. The Celtic grazing lands of…Ireland had been used to pasture cows for centuries. The British colonized…the Irish, transforming much of their countryside into an extended grazing land to raise cattle for a hungry consumer market at home…The British taste for beef had a devastating impact on the impoverished and disenfranchised people of…Ireland. Pushed off the best pasture land and forced to farm smaller plots of marginal land, the Irish turned to the potato, a crop that could be grown abundantly in less favorable soil. Eventually, cows took over much of Ireland, leaving the native population virtually dependent on the potato for survival. Despite being a major producer of beef, most of the people of Ireland during this period consumed little of the meat produced, in either fresh or salted form, due to its prohibitive cost. This was because most of the farms and its produce were owned by wealthy Anglo-Irish landlords and that most of the population were from families of poor tenant farmers, and that most of the corned beef was exported. The lack of beef or corned beef in the Irish diet is especially true in Northern Ireland and areas away from the major centres for corned beef production. However, individuals living in these production centres such as Cork did consume the product to a certain extent. The majority of Irish that resided in Ireland at the time mainly consumed dairy products and meats such as pork or salt pork, bacon and cabbage being a notable example of a traditional Irish meal. 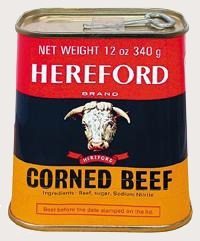 Although it ceased to be an important commodity in the 20th century Atlantic trade due in part to the abolition of slavery, corned beef production and its canned form remained important as a food source during World War II. 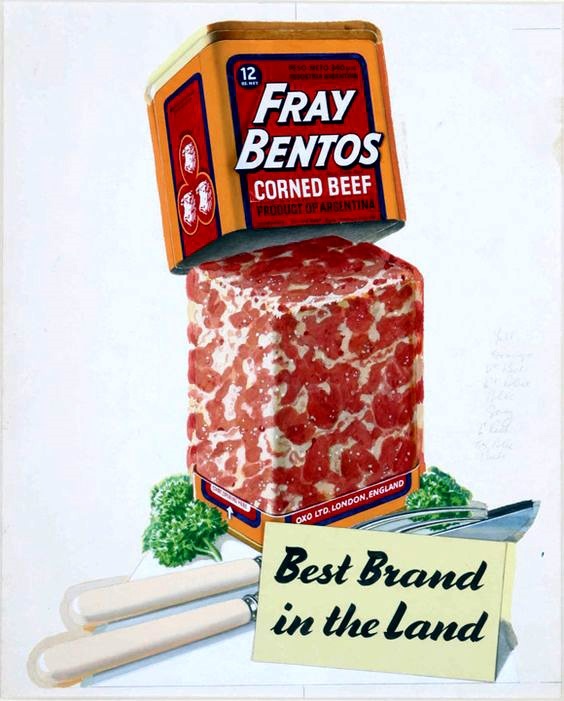 Much of the canned corned beef came from Fray Bentos in Uruguay, with over 16 million cans exported in 1943. Even now, significant amounts of the global canned corned beef supply comes from South America. 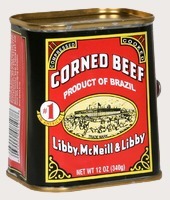 Today, around 80% of the global tinned corned beef supply originates from Brazil. In North America corned beef dishes are associated with traditional Irish cuisine. However, there is considerable debate about the association of corned beef with Ireland. Mark Kurlansky, in his book Salt, states that the Irish produced a salted beef around the Middle Ages that was the “forerunner of what today is known as Irish corned beef” and in the 17th century the English named the Irish salted beef “corned beef”. Some say it was not until the wave of 18th century Irish immigration to the United States that much of the ethnic Irish first began to consume corned beef dishes as seen today. The popularity of corned beef compared to bacon among the immigrant Irish may have been due to corned beef being considered a luxury product in their native land, while it was cheaply and readily available in America. In Ireland today, the serving of corned beef is geared toward tourist consumption and most Irish in Ireland do not identify the ingredient as native cuisine. 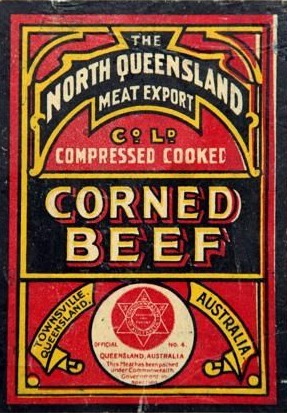 The Jewish population produced similar Salt-cured meat product made from beef brisket which the Irish immigrants purchased as corned beef from Jewish butchers. This may have been facilitated by the close cultural interactions and collaboration of these two diverse cultures in the USA’s main 19th and 20th century immigrant port of entry, New York City. 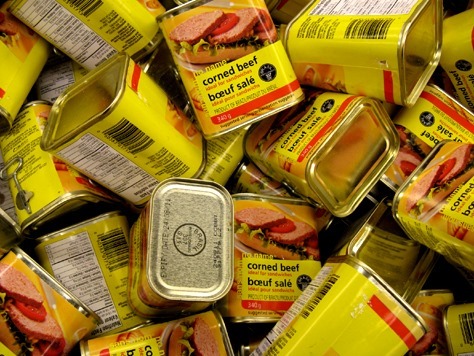 Canned corned beef has long become one of the standard meals included in military field ration packs around the world, due to its simplicity and instant preparation in such rations. One example is the American Meal, Ready-to-Eat pack.